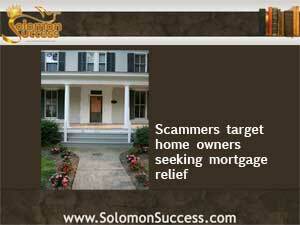 Solomon Success > Blog > Mortgage Relief Scams: Enticing Vulnerable Homeowners? After the housing crash of a few years ago, a variety of mortgage relief programs, or mortgage bailouts, appeared. Legitimately offered by government housing agencies and federally subsidized entities like Freddie Mac and Fannie Mae, as well as private lenders such as credit unions and banks, these programs offered struggling property owners a chance to refinance a mortgage in danger of default, or to work out payment arrangements if the mortgage wasn’t too far into default. Many scam companies claim that they represent the lender who holds the mortgage, or a government entity sponsoring the mortgage relief program. They might call themselves a law firm or credit-counseling bureau. Their pitch to homeowners claims that for a fee, they’ll take care of all the details involved in getting mortgages refinanced, payments reduced, or even a payment holiday granted. They may also tell homeowners to make mortgage payments directly to them, or that they’re collecting them on behalf of the lender. The Federal Trade Commission (FTC) compiles consumer information on avoiding scams, particularly real estate schemes. The FTC lists a number of warning signs for consumers to watch for, such as high pressure sales tactics that warn of dire consequences, extravagant guarantees to help every case, no matter the circumstances, and demands for upfront fees before any services are provided. For investors and residential homeowners alike, there are legitimate avenues for modifying troubled mortgages. And to protect consumers against mortgage relief fraud, the FTC has implemented the Mortgage Assistance Relief Services (MARS) Rule, which makes it illegal for companies to collect fees until the homeowner has actually accepted an offer of help directly from the mortgage lender. And, as the FTC recommends, any fraudulent practices should always be reported to the FTC itself, or the state attorney general’s office.